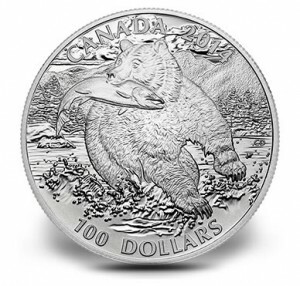 The Royal Canadian Mint has recently issued the 2014 $100 Grizzly Fine Silver Coin for sale to the public. This release marks the second issue of the Mint's Wildlife in Motion series. Like the the previous program release, the Grizzly Fine Silver Coin is available $100 which is the face value of the coin. Each is also struck from 99.99% pure silver. Showcased on the reverse of the coin is the image of a single grizzly bear. The bear is shown in the midst of "fishing" as a large trout is caught within its jaws. Behind the bear, a traditional Canadian stream and landscape view can be seen. The reverse design is the work of Claudio D’Angelo. Inscriptions surrounding the design include CANADA, 2014, and the legal tender face value of 100 DOLLARS. On the obverse, a portrait of Queen Elizabeth II can be found by Susanna Blunt. Inscriptions include ‘ELIZABETH II’ and ‘D.G. REGINA’. Each coin is struck to proof matte quality. Additional specifications include approximately 1.016 troy ounces of silver with a weight of 31.6 grams and a diameter of 40 mm. Appearing before the Grizzly Coin in the Wildlife in Motion Series was the 2013 Bison Fine Silver Coin. That strike, which was released in May of this year, quickly achieved a sell-out of its entire mintage of 50,000 despite a strict household order limit of one. That same mintage applies to the Grizzly Silver Coin indicating a repeat sell-out will occur. As mentioned, these coins are being sold at their legal tender face value of $100. A Royal Canadian Mint display case is included with each coin along with an illustrated shipper. For more information, or to purchase while the mintage lasts, please visit the Royal Canadian Mint's website located at www.mint.ca. Orders are also accepted via phone by calling 1-800-267-1871 (Canada), 1-800-268-6468 (US) or (613) 954-2626 (International).